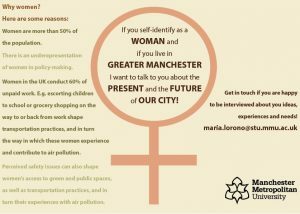 Manchester Friends of the Earth | Interviews with women for PhD project on air pollution – can you help? ← Through the Mill (Ancoats Festival) Sat 15th September – can you help on a Manchester FoE campaign stall ? My name is Maria – I am a PhD student at Manchester Metropolitan University. My PhD focuses on promoting the voices of citizens when it comes to air pollution and designing future clean urban environments. Specifically, I am focusing on women. (2) women and men generally have different mobility patterns in the city which impact how women contribute to and experience air pollution. For example, unpaid work – such as taking care of children – falls disproportionately upon women and this in turn impacts the way women travel in the city. Trips related to unpaid work often involve chained trips with many stops, rather than trips with one single stop (i.e. from home to work and vice versa). These type of trips and the needs that arise from conducting unpaid work are often not considered when designing transport services, and priority is given to trips in relation to employment and leisure – punishing those who are in charge of unpaid work and who most often are women. 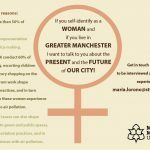 My area of study is Greater Manchester (GM), so I am looking to interview anybody who self-identifies as a woman and lives in GM.